Asthma is the most common chronic disease in children and is responsible for more school absences than any other childhood disease in this country. It is a disease with a long history and is surrounded by much misconception and fear. Asthma is constantly being studied in the medical community which leads to new methods of diagnosis and treatment. Asthma is a disease characterized by repeated, mostly reversible episodes of wheezing. The symptoms of asthma are the end result of a series of reactions occurring in the body set off by a variety of causes. These causes vary from true allergy to specific substances in the air, to emotions, to exercise, to plain old colds. The tendency to develop asthma may very well be an inborn trait present from birth but the final common pathway of observable events remains the same: the development of small airway narrowing (bronchioles) with a decreased ability to move air in and out of the lungs, slowing down the normal process of exchanging oxygen from the air for carbon dioxide from the body through the lungs. The reasons for this narrowing are related to inflammation in those airways with the production of mucus, and muscle spasm surrounding the airways: all have the effect of narrowing these airways. Oxygen is needed by every cell in the body in order to carry on the process of metabolizing various products that we use every minute of every day. When the inability to properly exchange these gases is recognized by the body, a series of changes immediately takes place to make the system work better. Because each breath brings in less oxygen, the rate of breathing increases so as to equalize the gas exchange rate. 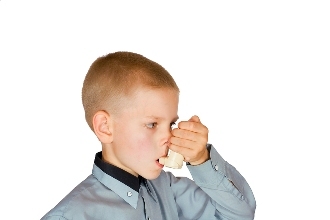 We see that as breathing faster in the child with an asthmatic attack. Since the air that does get in and out must go though narrower airways, a person having an asthma attack must use accessory muscles (such as abdominal and even neck muscles) to help breath, and we see that as working harder to breath, and may even hear it as a whistling sound as the air is forced through narrow spaces (wheezing). Cough is produced as a reflex to the various changes in the airways. As the lack of gas exchange progresses there are further changes that can lead to failure of the lungs to do any of the work. Needless to say, it is important to recognize the symptoms of asthma and treat vigorously. Many children will have wheezing during the first two years of life and this is usually part of a viral respiratory infection. This child will usually not have wheezing at any other times. A small percent of these children will develop true asthma over time but at this time it is difficult to tell who they will be. Many children outgrow this type of wheezing and therefore many physicians will withhold labeling a child with “asthma” until at least 2-3 years of age. There is also several other types of “asthma”. Some children with allergies develop wheezing secondary to exercise – or exercise induced asthma (especially in cold weather). Others might just have a persistent cough without wheezing for no apparent reason and might eventually be diagnosed with “cough variant asthma”. If your child has already been diagnosed with asthma you will already know most of the information in this article. If your child has had a few previous episodes of “wheezing” or seems to be “wheezing” for the first time and your child’s breathing is not normal (remember the symptoms mentioned above), you will need to call your Doctor for further information and treatment. There are many ways to treat the symptoms of asthma and get these under control. There are also many ways to control and prevent the episodes of asthma and therefore the aim of treatment is to relieve and prevent the symptoms, allowing your child to be normally active and to enjoy all the activities of childhood without breathing problems. These treatments are very effective, and the well educated family unit blends with the medical home to produce excellent outcomes and many fewer episodes leading to sickness and missing school. Do You Know Your Family’s Asthma Triggers? Childhood Illnesses – Are We Winning The Battle?